The distance between the handle and the blade of this scalpel (18 cm) has been lengthened to reduce the risk of contamination. The handle’s low weight and ergonomic shape makes this a handy tool for cutting plantlets. 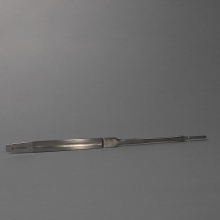 This handle is ideal for #10 and #11 scalpel blades.